Back in the day, Qantas crews referred to their long-haul Super Constellations as ‘the best three-engined airliners in the world’. The complicated, 18 cylinder turbo-compound Wright R-3350-972-TC18DA ‘Duplex Cyclone’ engines arrayed along the wings paid for their incredible 3,250 HP output (each) with a propensity to failure. In fact, Qantas had spare engines stored at every stop along its Kangaroo Route from Sydney, Australia to London, England – and was constantly ferrying more. They needed them. Incidentally, the route typically involved some 65 hours of flying time with stops at Darwin, Singapore (overnight), Calcutta, Karachi, Cairo (overnight) and Tripoli. Return tickets cost around £600, or 130 weeks of average income. Today, Sydney-siders can get to London and back in a third of the flight time, and pay less than one fortieth of the real cost. Built as a C-121C transport (cn #4176) for the USAAF she was delivered to the 1608th Military Air Transport Wing at Charleston, South Carolina in October 1955, as serial 54-0157. She later served with the Mississippi ANG, West Virginia ANG and Pennsylvania ANG before being retired to Davis-Monthan AFB in 1977. HARS volunteers found the derelict aircraft in 1990 with, after 9 years bereft of care, maintenance or even closure, a substantial population of birds and ‘white dielectric material’. 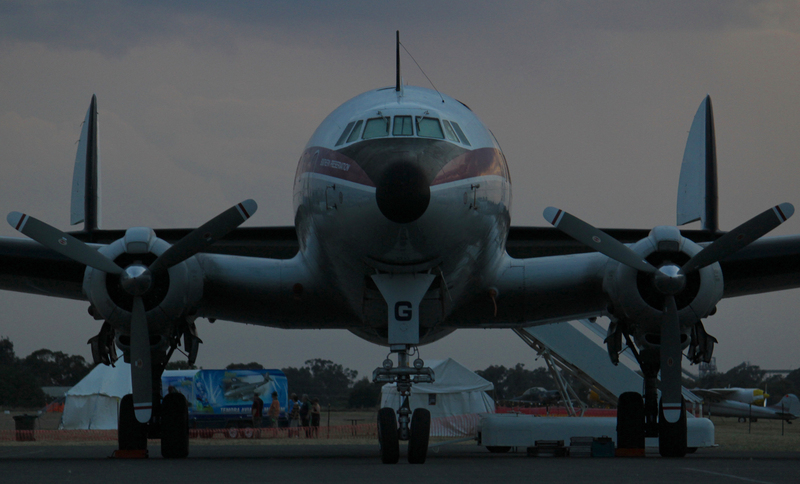 The ambitious restoration took five years, 16,000 hours and $800,00 – but on February 3rd, 1996, the graceful propliner touched down in Sydney, NSW after a trouble-free 39.5 hours’ flight time across the Pacific Ocean. At first glance, she looks like a 1950s Qantas Super Constellation but, aside from winged kangaroo logos on the tail fins, the livery is only a tribute. The airline titling actually reads ‘Connie’ and the aircraft’s official name is a very fitting ‘Southern Preservation’. But still, everyone just calls her ‘Connie’. Qantas presents…VH-EAG. The brand new L1049C starring in a period advertising piece. One authentic touch is the VH-EAG registration, which was originally (as far as I know) applied to the very first Qantas L-1049 Super Constellation, cn 4539. 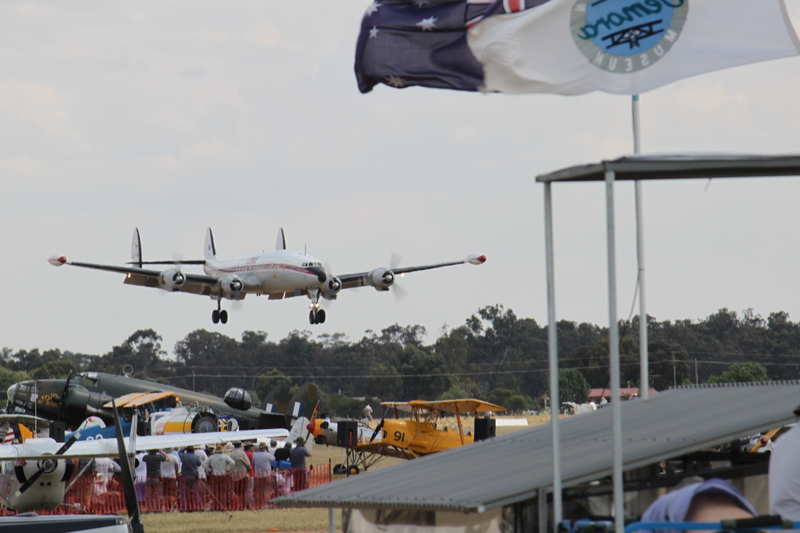 It first flew from Lockheed Burbank on March 18th, 1954 and was flown into Sydney by a Qantas crew on April 15th that year to enter revenue service. She carried her last paying passengers for the airline in April 1963 before being sold to Boeing/Airmotive Inc for parts, with 21,844 flight hours on the clock. 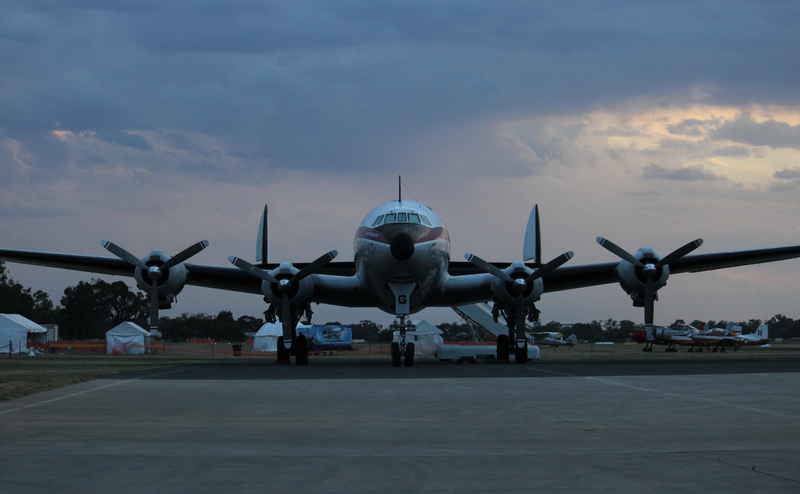 As well as being the first Super Constellation to join Qantas, she was the last to leave. The airframe was scrapped in the US in 1965. 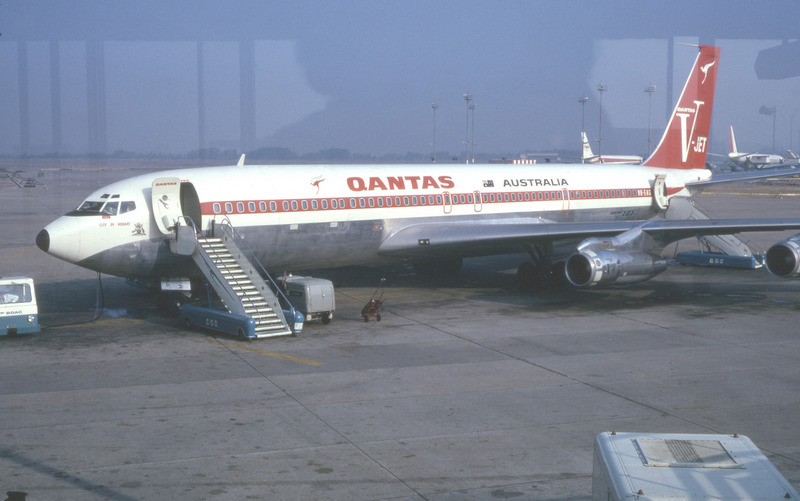 Shortly after, Qantas assigned the same storied registration to a new Boeing 707-338C ‘V-Jet’, cn 19627-707. (This was no nod to history though; the jet was simply the 7th in a block of 10 Boeing 707-338s (cn 19621 – 19630) ordered in the mid-1960s). The jetliner first flew from Renton on April 30th, 1968 and arrived in Sydney on May 18th, where it was dubbed ‘City of Hobart’ and put to work. Renamed ‘Alice Springs’ in February 1974, the aircraft was used to evacuate cyclone survivors from Darwin in December 1974, and flew several ‘final 707’ services for Qantas during March 1979. After ferrying passengers stranded by the national air traffic controllers’ strike from Sydney to Melbourne on March 26th, 1979, she flew Qantas’ last-ever 707 revenue service on the return leg, with just four passengers aboard. Her airline service ended after 38,013 flight hours and 14,498 cycles. She was sold to the RAAF and officially handed over on April 7th, 1979, becoming VIP transport A20-627 with No.33 Squadron based at RAAF Richmond. After a further 12,175 hours flying for the RAAF she was retired on February 21st, 2001 and used for parts before being scrapped at Richmond in December 2009. Somewhat fittingly, her cockpit section was donated to HARS for preservation. So, after that grand circle, this month’s header image is a good analogue for airscape’s current status. Despite past hiccups, it feels like all four engines are turning smoothly on bringing history into the present… something I believe is always relevant and important. 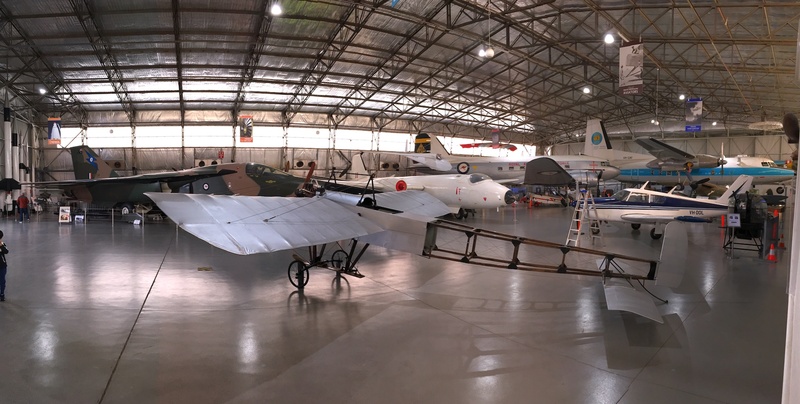 Along with writing the occasional post here, I’ve been at the South Australian Aviation Museum this week photographing their latest completed restoration – a 1966 replica of Clyde Cessna’s Bleriot XI ‘Silver Wing’, in which he taught himself to fly during 1911. Connie history from Historical Aircraft Restoration Society. Well, I started writing a comment here and it turned into a full post. But I will just add that my thoughts are best encapsulated by the fact that the only airplane in your list of pioneering airframes that was build in the last half century is Jon’s RV-4. What else does one need to say? There are airports out there where the dream is still alive. Mojave comes to mind. But for every one of them, for every RV, there are hundreds of decrepit Cessnas, Pipers, and other old airframes testifying to the “facts on the ground”. Did the early pioneers have to worry? Nah. There was nothing to worry about! I hear you, Ron! I have no doubt that the Experimental category is the hope and joy of the GA world. That’s no coincidence, given the entire science of aviation was brought forth by homebuilders. Now Scaled Composites, a company founded by a homebuilder, is flying to space while tomorrow’s pilots wash bugs off of 40-year-old spam cans. If pioneer pilots worried about anything, it was missing out on the latest innovation or the flying hottest ship. 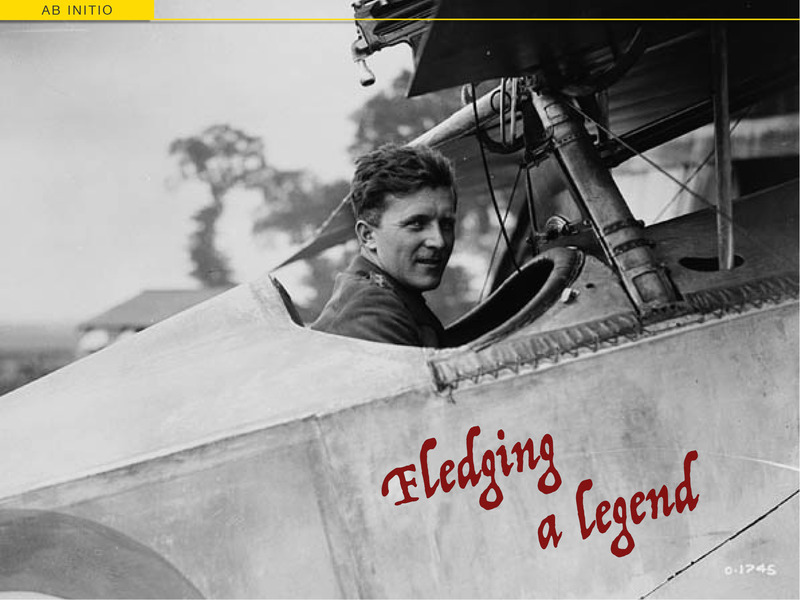 I know how they felt – but only when I look at vintage airplanes and homebuilt designs. What an incredible job they have done restoring that Connie. She is a beautiful example and hopefully the engine reliability issue won’t affect her flying schedule. I wonder, if the engines were so unreliable, did any crash as a result? It seems one or two of them did crash due to engine failure. January 17, 1955: A US Navy C-121J, 131639, crashed in the Atlantic off Stephenville, Canada due to double engine failure, killing all 13 on board. December 23, 1957: A US Navy WV-2, 143197, ditched off Kahaku Point, Hawaii after all four engines failed, killing 19 of 23 on board. April 2, 1959: A US Navy WV-2, 141303, landed hard and crashed at Argentia NAS after an engine failed while on an airborne radar patrol, killing one of 29 on board. August 24, 1960: A Qantas L-1049G, VH-EAC, c/o 4606, during takeoff from runway 13 at Plaisance International Airport Mauritius, engine number 3 lost power just before reaching the V1 speed of 115 knots. The captain pulled off the power, braked hard, but the aircraft did not decelerate as expected. The flight engineer feathered the number 3 engine and pulled its emergency shut-off valve. 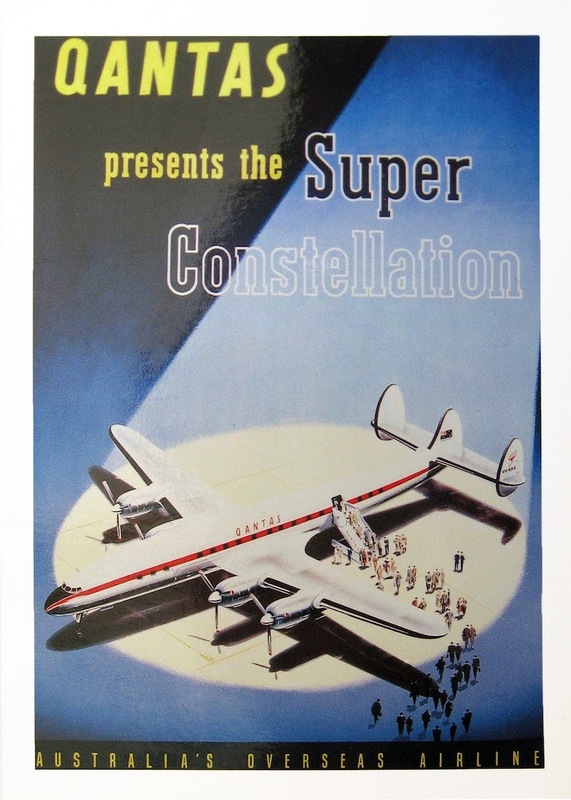 The Super Constellation, named “Southern Wave”, could not be brought to a stop on the remaining runway and overran the runway at a speed of 40 knots. The Super Constellation bounced over a low embankment, crashed into a gully and caught fire. Of the 38 passengers and 12 crew all survived the crash. July 11, 1965: A USAH EC-121H, 55-0136, ditched off Nantucket after one engine failed and another caught fire. The fuselage broke into three pieces. Three survivors were found along with nine dead, but seven were never found. April 25, 1967: A USAF EC-121H, 53-0549, crashed 1 mi off Nantucket due to an engine fire, killing 15 of 16 on board. One thing that immediately stands out (for those who have ever seen RAIN MAN) is that Quantas DID have a crash. Just no fatalities. Thank you Mitch for the added information. It would seem the engine problem was indeed a ‘problem’ and caused several accidents as a result. It’s surprising then that grounding of the aircraft didn’t occur (or did it?). The saga of the Comet springs to mind with this, although fatalities were obviously much higher in that case. It’s an interesting point. Of course, Comet was the grandaddy of all air crash investigations as we now understand them and the reasons were complex – loss of life, complete mystery, new technology, national pride and the national economic impact (which wasn’t averted). Until then there’d been quite a prevalent ‘kick the wreckage and pick the cause’ approach, based on a finite number of understood failings. I think the Constellation family would have fallen into this category – but the phrase ‘Tombstone Imperative’ does come to mind. We benefit from a far more nuanced and dimensioned approach to causation these days, based largely on the concept of an accident chain and thanks largely to Comet. There’s really not a lot of point in try to redeem Comet at this late stage, but did you know Qantas operated Comet IVs while waiting for their Boing 707-338s to be delivered (from November 1959 to May 1963)? I wonder which they preferred? I think the tragedy of Comet certainly gave rise to better ways of investigations and perhaps led to higher standards in aircraft design, testing and crash investigations when it did happen. It perhaps was an accident waiting to happen and was unfortunate when it did. But, out of all tragedies come benefits and we seem to have improved greatly from Comet. I always think that aircraft accidents get more coverage because of the nature of them, higher fatalities and more ‘dramatic’ than say a train crash. Connies had lower passenger numbers and were perhaps less ‘news worthy’ at the time. It’s interesting to see that Quantas operated Comets, that I didn’t know, and yes it would be interesting to see which was preferred, a useful comparison! For what it’s worth, I suspect ‘waiting to happen’ is the bedrock (excuse the pun) of the Tombstone Imperative. If it hadn’t been Comet, it would almost certainly have been another line of passenger jets. I’m not sure quite how to get some qualitative reflections on Comets versus 707s. Hopefully an opportunity will come up. I’m sure you are right, if not Comet then it would have been something else, it was as you say Tombstone Imperative. Maybe one day, an ex pilot / employee of Quantas will stumble across your site and say what the general feeling was, or a challenge for you perhaps to locate and interview one such person! It would be fascinating to learn more about the ‘care and feeding’ routine for this great old lady. She obviously gets all the attention she needs from the folks at HARS – and I’m sure they are extremely risk averse with every aspect of her operations. I started looking into the type’s accident history for you, but I think Mitch has handed us a pretty good summary. 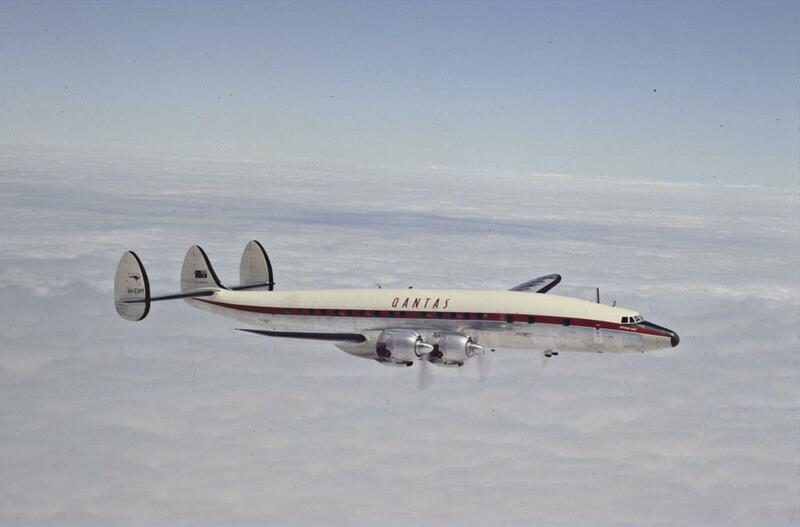 There’s a full listing of Constellation accidents on Wikipedia here but the short version is that it was indeed a very fine three-engined airliner, unless the downward transition happened at the wrong time. That aside, it’s a remarkable aircraft and goes to show what, with dedication and hard work, volunteers can achieve. I’d be willing to bet she is the subject of SO many checks and a more than rigorous servicing schedule, given the type’s history. She undoubtedly spends more hours being worked on than she does in the air, but what an absolute beauty she is! I think that would be a safe bet. I remember taxiing out for a flying lesson at Bankstown one afternoon, and getting ‘caught’ behind Connie as she went through her four engine run-ups and eight mag checks. They certainly took their time – and we didn’t mind a bit!! Another fascinating and frankly superb article, true to the Airscape tradition! Thoroughly enjoyable read as always. One person not to worry about the future was Kelly Johnson of Lockheed and Skunk Works fame. He relished the challenges the CIA and later the “Blue Suiters”set for him and oversaw some stupendous projects including the SR 71! Thanks Nick. Good on you for raising Kelly Johnson’s memory too: My favourite bit of Constellation trivia is that the wing design was simply scaled up from the P-38. So he was a pragmatic genius! Nearest I could come to your being stuck behind Connie and not minding, is me as an Air Cadet, standing beneath the Port wing of the BBMF Lancaster during her four engine run up prior to display at Biggin Hill. There were not enough ear defenders to go round so I stood just off the wingtip, slightly aft, bare eared and hanging on to my beret, not minding one little bit as the Merlins were started one by one! Well I can’t top that! But if I had to risk permanent hearing damage, that method would be high on my list. What a way to go! Eh? What was that? Sorry, think its half past seven! Great read about the Quantas Connies. 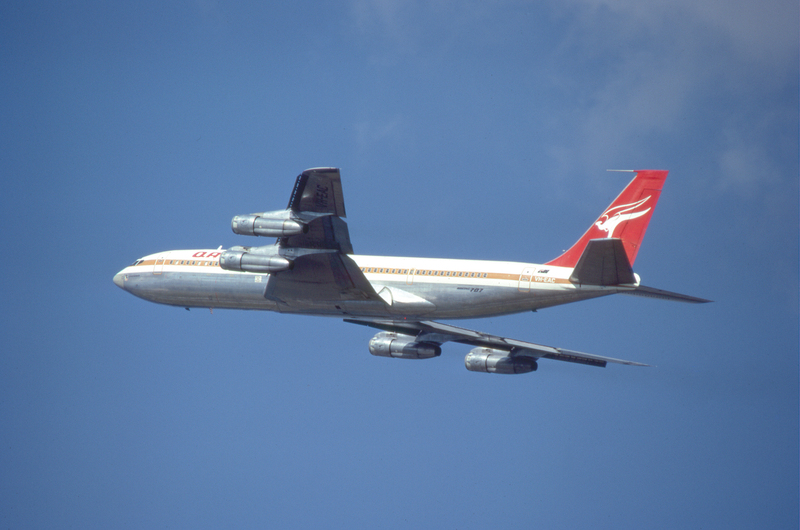 There’s also a great photo of a Qantas 707-338 on Wikipedia, with a spare engine in the under-wing transport pod – so it’s not like the problem went away! Great and enjoyable article about restoration. I particularly admired how people volunteered to restore the airplane. Thanks Airscape. You’re welcome – I’m glad you enjoyed it.